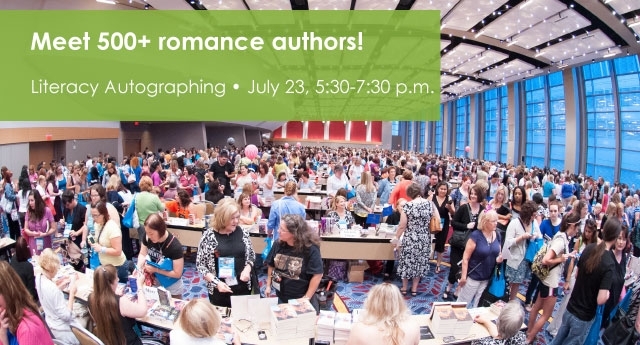 If you live anywhere near San Antonio, please come along to the Romance Writers of America’s Literacy Autographing tomorrow evening (Wednesday July 23) from 5:30 – 7:30 p.m. at the Marriott Rivercenter. There’ll be hundreds of romance authors (including me!) selling and autographing our books to benefit ProLiteracy Worldwide and several local literacy organizations. I’ll have print copies of Mine Under The Mistletoe and Knowing the Score. Even if you’ve already read them, this is your one chance to get them in print! And I’ll have some fun London Legends swag and British chocolates for you, as well as an excerpt booklet for Tempting the Player. So come meet your favorite authors and say hello to me – please don’t make me sit there all on my own! Never been to an RWA literacy autographing before? Here’s a behind-the-scenes video from last year’s event. And here’s me reading (badly! I’m terrible on camera :/ ) from Mine Under The Mistletoe. I’m really not sure this will tempt you to come see me, though!